The companies that built most of the mega-skyscrapers in Dubai have “non-fire-rated exterior panels,” which means they may not be structurally sufficient in the wake of a blaze akin to the fire that occurred at the Address Downtown Hotel on New Year’s Eve, UAE’s The National reports. ‘The Address’ hotel went up in flames on New Year’s Eve, suffering severe damage to its exterior and causing major embarrassment for the small Gulf nation, which decided to go ahead with celebrations while the tower was still burning. Because of the skyscraper’s height, it was almost impossible for firefighters to put out the fire until it had burned itself out, and took much of the building’s exterior with it in the process. The panels used to form the exterior in most of the Dubai skyscrapers, including The Address, were made by a company based in Sharjah, which is one of the UAE’s emirates. 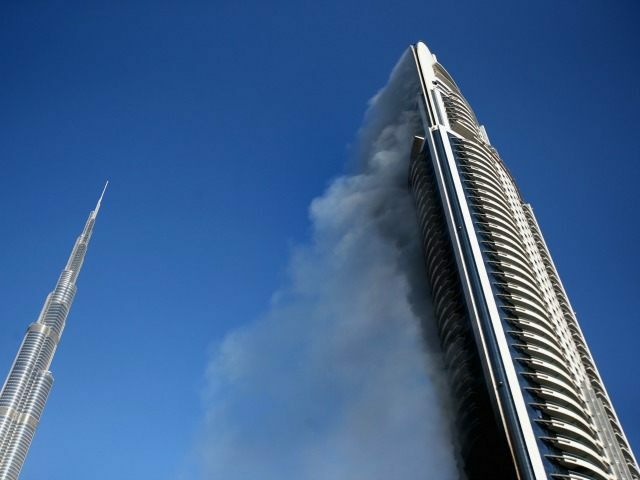 In 2006, the company won a $20 million dollar contract to build its poorly rated fire panels on The Address hotel, the report said. This same company built the panels on a tower that went up in flames in 2007, causing the deaths of two construction workers and injuries to “dozens,” the UAE paper found. Luckily for the residents and visitors who were staying inside the building, the interior fire-extinguishing systems worked sufficiently, allowing them time to evacuate the building before the fire gutted much of the hotel. There still is no authoritative statement from the UAE on the cause of the blaze, but the Dubai Civil Defense organization is currently conducting an investigation into the matter, according to reports. A UAE spokesman told news outlets to expect a statement this week. Stories have emerged of residents of the hotel losing all of their possessions in the blaze, though there appear to have been no serious injuries or deaths recorded. The UAE has been routinely condemned by human rights groups for the lack of safety standards concerning its half-million person migrant worker force. Following a construction boom in the early 2000s, the UAE imported cheap labor that now comprises 95 percent of its overall workforce, according to the Health and Human Rights Journal. The UAE implements the kafala system for its migrant workers, “which has been described as modern-day slavery,” the journal stated. And the system “has resulted in gross human rights abuses,” accounting for many deaths and injuries on the job due to lax safety standards. In Abu Dhabi alone, about 104 migrant workers are killed each year in accidents, the report said. And in the past 10 years, independent researchers have counted at least 880 deaths among migrant construction workers.